While the weather in Tampa is usually sunny, it does rain every now and then. And, on a hot and humid summer day, it’s good to have some indoor plans in cool air-conditioned comfort. 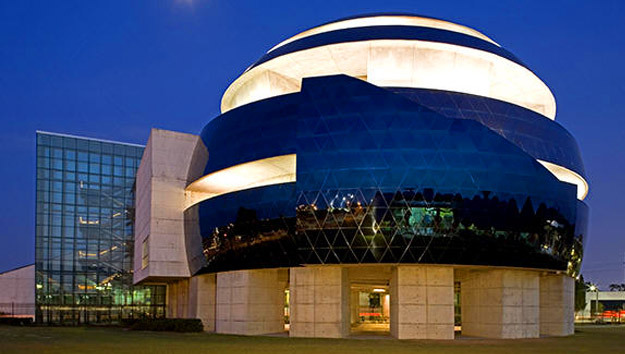 Tampa has a nice selection of museums and attractions clustered together in distinct areas. Getting from one area to another is easily done by car. Or, to get to three of Tampa’s districts with indoor things to do – Downtown, Channelside, and Ybor City – park the car and hop on the TECO Trolley using their reasonable all day pass. It’s a fun, convenient ride. This small gem is located in an architecturally stunning building on Tampa Riverwalk by the Convention Center. Dynamic, constantly changing, beautifully curated traveling exhibitions and a growing permanent collection create a dynamic visual experience. It’s not large or world-class by mega-city standards, it’s a pleasant experience with just enough to see without sensory overload. Also, the museum’s SONO Restaurant is delightful, offering delicious salads and sandwiches. Nearby is an architecturally eye-catching glass office building aptly called “the Cube” whose 2nd and 3rd floors are devoted to a tiny but compelling collection of rotating photography exhibits from the museum’s growing permanent collection, primarily works of local photographers. On occasion, traveling exhibitions add diversity, enhancing the experience. Walking through the large space with limited works on exhibit is a short, interesting experience, great for photo buffs and just enough for those not particularly into photography. Kids love it! Especially young ones up to about 8 or 9. It doesn’t get much better than this: 3 floors of total interactive fun, activity, building and role-playing. Next door to the Museum of Art is the Glaser, which is a wonderful place where kids can imagine and be creative. Interactive exhibits within 17 themed areas connect kids to everyday work people do. They can make a movie, paint with light, make and fly a paper airplane, be a firefighter, vet, TV anchor, meteorologist and more! It’s popular, so expect lots of kids just having fun! This historic treasure, located in a wing of the former magnificent historic Gilded Age Tampa Bay Hotel is just across the river from Tampa Riverwalk, and an easy stroll over the bridge way. Through lifestyle exhibits in 13 antique and artifact filled rooms, the Henry B. Plant Museum tells the story of Tampa in the late 1800s, a time in Florida history when the wealth and vision of railroad magnates created opulent tourist destinations out of tropical Florida wetlands. Railroad, steamship and hotel tycoon Henry Bradley Plant built a railroad down the west coast of Florida to bring tourists to Tampa’s tropical wilderness. To accommodate his guests, he built the over-the-top, palatial Tampa Bay Hotel, a grand, vast 511-room luxury resort with all the latest amenities, called “one of the modern wonders of the world” at the time of its opening. A self-guided audio tour of the museum offers a fascinating glimpse into the life and leisure of the Gilded Age in America in the new tropical frontier. Drive just east of downtown, or hop on the TECO trolley, to check out indoor activities in Tampa’s Channelside District. 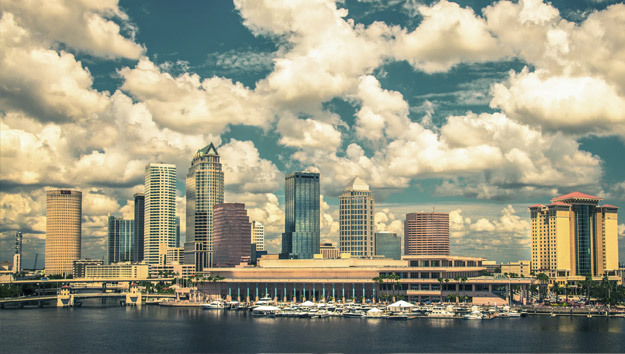 Located adjacent to the active Port of Tampa, it’s the destination of cruise ships, location of Amelie Arena, home of the Tampa Bay Lightnings, hotels, some restaurants and shops and attractions. Inside, this relatively small aquarium by mega Aquarium standards, it’s an engaging, interesting place to spend a couple of hours. 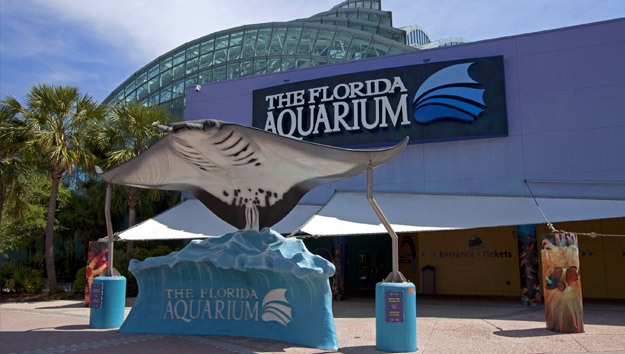 The focus of exhibits here is on the interrelationships of aquatic plants and animals in nature, both of those native to Florida and from around the world. See alligators stealthily moving through bogs and magnificent wading birds flying overhead in the swamps of Florida’s wetlands. Journey to Madagascar to see lemurs, chameleons and millions of cockroaches (creepy!). Watch sea otters frolicking in the water. Experience the diversity of action-filled, colorful life of coral reefs, from shallow water reefs to those 60 feet under. Touch stingrays and more in the touch tank; get lost in the technological interactivity of Ocean Commotion. It’s a special place with lots of positive take-away experiences. If you’re a maritime history buff, a tour of this 1940 era merchant cargo ship is interesting. Young people enjoy climbing in and around it too. A link to our maritime past, it was a Liberty ship in WWII, supplying vital supplies to troops overseas, and also saw service in the Korean and Vietnam Wars. Walking through the ship gives a good perspective of life aboard and a feel for the history it saw and made. Do it on an overcast or cool day as it’s sweltering inside. Florida is perceived as a sun and fun place with limited historical roots. Through exhibits of tools and weapons, many made of shell, and pottery of Florida’s first people, the Tocobaga and Calusa, we can imagine Florida during their time. The story moves chronologically to exhibits of Spanish and French 16th century explorers, several of whom landed in the Tampa Bay area. Artifacts tell the story of the hardy pioneers who established roots while enduring mosquitoes swarming black, hot, humid weather and wetland creatures to create settlements, bringing cattle to Florida’s vast interior landscape to establish a Florida’s cattle industry. You will leave here knowing what a “cracker” is! The center explores rich Seminole and Miccosukee cultures through exhibits of clothing, jewelry and Everglades grass baskets. Its cigar memorabilia is unsurpassed, chronicling the grown of the cigar industry and the lasting cultural impact of the Cuban who migrated to the area with their cigar-making skills. It traces the impact on modern Florida of railroad tycoons like Henry Plant, Baron Collier, Henry Flagler, and highlights sport legends. Three very different places not in the 3 districts above are great rainy day/hot day activities. For a real taste of Tampa’s Cuban culture, drive (or take the TECO Trolley) to historic Ybor City, at one time the vital center of Tampa’s cigar industry. It has a real Cuban vibe, reflected in the architecture, brick streets and brick buildings, many old warehouses and former cigar factories, which now house bars, hand-made cigar shops, trendy and vintage clothing shops, and restaurants serving real Cuban food. It’s an interesting place by day; a rowdy party place by night. Having a Cuban meal is a must. The Columbia Restaurant, is an oldie but goodie. Tampa Bay Brewing is located here too, with a tasting room and tours on Saturday afternoons only. Tiny Ybor City Museum State Park is open for self-guided tours of a recreated cigar makers house. This is one fabulous place, great for tech-savvy teens, young adults and adults of any age who are into the future of technology. Located in north Tampa, adjacent to University of South Florida campus, it’s a must see, well worth the car ride up I-75 to get there. All about technology of the future, it’s exciting and thought-provoking. Here, the sky is not the limit! Through 450+ exhibits, many interactive and hands on, space, astronomy, past, present and future, robotics, gaming and more is explored. Technology is moving at warp speed, and this museum keeps the pace. The new Drone Zone is a great example. You can fly, drive and dive a commercial drone in the air, land and underwater. Or, experience how the car of the future rides – driverless of course! Or, code robots; explore 3-D printing. See into the night sky, explore space, experience the journey of humpback whales and more in the IMAX Theater. Walk into the future at MOSI! A short drive west of downtown, this is a fun place to visit for anyone 21 and over who enjoys beer and is into beer-making and craft beer. CCB highlights the Latin culture and tobacco manufacturing heritage of Tampa in their recipes, labels and beer names. Try a flight of what’s on tap in their Tasting Room, always a popular past-time. Or, take a tour, offered on the hour Wed – Sunday from 11am to anywhere between 3 and 5pm, depending on the day. Tour sign-ups are made in person at the brewery, but look for an online reservation system coming soon. For the $5.35 tour price you get a CCB pint glass souvenir and 16oz of beer on the tour. Two bonus suggestions: If you like great art, there are two museums in St. Petersburg across the bay are well worth the 1/2 hour car ride. Standing out distinctively along St. Petersburg’s lovely waterfront is an architecturally acclaimed building featuring 1062 triangular-shaped glass panels. Inside is the largest collection outside Europe of Salvador Dali, the late Spanish surrealist. It’s a sensational visual, optical and intellectual experience, regardless of whether you appreciate or understand Dali’s art. His famous Gala Contemplating the Mediterranean Sea Which at Twenty Meters Becomes the Portrait of Abraham Lincoln is an optical illusion stunner. All you can say is “Wow, how did he do it?” There’s a great little restaurant (with a view) inside, and a superb Dali-centric gift shop too. Also located in downtown St. Petersburg’s waterfront area near the Dali Museum in an area of galleries, restaurants and shops, is the permanent collection of Dale Chihuly’s distinctive masterful large-scale art in glass. It will take your breath away. The architecturally significant building holding the installation of his art was designed so that the art and architecture would work together for a total experience. And what an experience it is! Spectacular Ruby Red Icicle Chandelier is here as well of some of his most globally recognized series. Before leaving the area, walk a mile west to Morean Art Center to see more great glass art as well as a glass studio and hot shop.